To a stranger, Clarabelle looks like an average, standard black poodle. But to Luke Smolinski and his parents, Jackie and Steve, she’s crucial to the 5 year old’s safety and well-being. 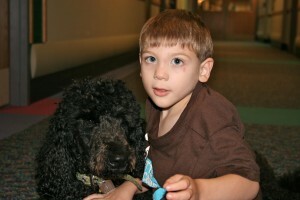 Since October 2009, Clarabelle has never been far from Luke’s side, detecting his seizures anywhere from 6-20 minutes before they happen.